Every homeowner is dealing with that same uninvited guest that starts popping in this time of year. Obnoxiously oblivious to the displeasure of the owner, some weeds just cannot take a hint. But what's the best way to rid your yard of these unwanted plants? While California is beginning to label RoundUp as a carcinogen and even pregnant mothers are warned of the dangers, it's a great time to start looking at organic methods of ridding and preventing weeds from popping up. Whether you have a private well, pet, kids, pregnant belly, or basic health goals – give these natural weed prevention methods a try! 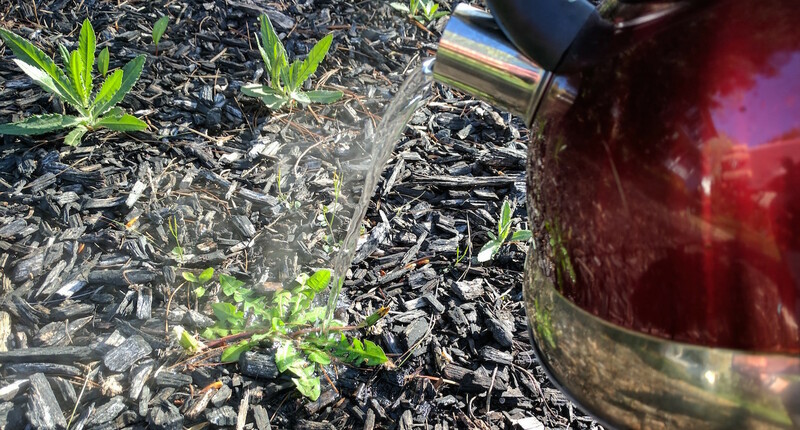 Before we delve into the simple methods for naturally combating weeds, you need to know the single most important part of the process: persistence. We'll equip you with an incredible arsenal, but without persistence, these nagging green pests won't stay away long. Weeds are never a "once and done" issue, and it takes persistence to not only win each battle, but the war. While getting ready for gardening season, make sure you pencil in at least one or two hours over the course of a week for weed patrol. While that may seem unnecessary, waiting to pull a weed until it is obvious and mature is too late from stopping the runners or seeds from spreading. Get out there and scan the yard for them sooner rather than later. Removing weeds, by hand, is certainly the most obvious way to eliminate them. However, be absolutely sure you are not ripping plants out solely at ground level. Many weeds have surprisingly deep taproots and can just become a returning problem fairly quickly. To help, try watering the beds or yards before a weed hunt and you should be able to dislodge roots and other weeds easily. Want to nourish the soil and smother weeds at the same time? You're going to love the newspaper trick! Lay down thick layers of newspaper over the entire flowerbed, surrounding your desired plants without smothering them. After a quick spray of the hose to dampen the newspaper and keep it in place, you're ready to add the mulch. In less than four weeks those pesky weeds will die back entirely while your plants still easily receive water and feed on the beneficial soil. Don't be surprised if this method prevents weed for the entire year or even two! It sounds merciless, but it is meant to be! Bring water to a rolling boil for a few minutes, then take it to the garden where you use controlled amounts (a pot with a pouring lip is great here) to scald unwanted plants. Incorporate this as part of your everyday life, by dumping boiling water from cooking pasta or making tea on targeted weeds in the garden. On a bright day, white vinegar (especially food grade with 15-20% acetic acid) burns the leaves of weeds with the aid of the sun; this destroys them from the ground up, but not penetrating deeply to the roots. 1 gallon of vinegar + 1 cup of salt + 1 tablespoon of liquid dish detergent = a weed's worst nightmare. By combining our last 2 methods, you're going to get a potent weapon again those green pests. Put the mixture into a plastic spray bottle and spray directly on the weed your battling. Make sure the weed is in the sun to really activate the vinegar and be careful to stay clear of anywhere you intend to plant and grow in the future. Did you know survival of the fittest applies to plants too? Weeds will be naturally smothered and deprived of nutrients if you plant heartier perennials, crops, and groundcovers as competition. The plants that thrive take all of the resources, and the weeds can't take hold if there's no space for them. We've heard rumors that rock salt can be effective (and cheap as stores are now pushing remaining inventory at deeply discounted rates). We've put this to the test, densely covering an area that was highly susceptible to weeds, but no luck. Have you prevented weeds with rock salt? Share your secret! With so much bad news coming out about the dangers of chemical weed killers, there is a peace that accompanies these simple and natural methods. And the best part? You have most of these supplies on hand! So go make yourself a pot of pasta and get started!